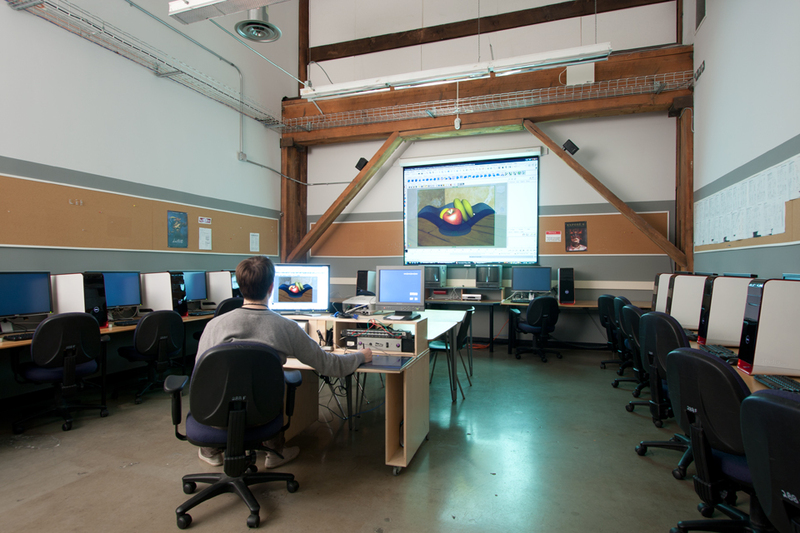 The Animation Department at Emily Carr University is composed of multiple labs offering facilities to support a range of digital and traditional animation processes. Area wide, you will find specialized computer labs that include the full Autodesk Creation Suite, the Adobe Creative Suite, Realflow, ZBrush, V-ray and a dedicated sound effects library. The studios also include animation line testers, classical animation tables, Cintiq tablets, bulk scanners and a rotoscope. There is studio space with resources to support the creation of stop motion animation, including rostrum stands for both 16mm film and DSLR capture with Dragon Stop Motion. For students creating work in 3D, there is a render farm with dedicated machines to render their work over the network, using Qube.